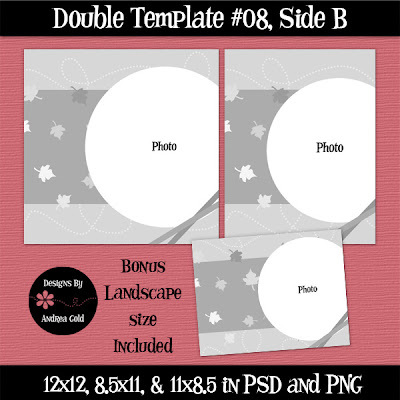 Andrea's Bits and Scraps and Little Ironies: Calendar templates! We actually had our first snow of the season in Utah today! I'm pretty excited for winter! Thanks so much for the great comments! They really keeps me going with the freebies! We just started being able to leave our windows open and get some fresh air in the house with out it being over 80 inside... lol It was a high of 86 today... and I'm on the TN/GA line... but we are getting into the high 50's low 60's around 6 am right before it starts to warm back up. Thanks for the 2nd side Sweetie!!! Oh my thanks for part 2 of this so pretty template. Love the oval shapes and the landscape template. You are definitely spoiling us beyond imagination. I have a question about the posting time, so later this week I will send you an email. Now to check my downloads, but I am sure that I do not have side A. Again, thanks for side B and its beautiful leaves. So perfect for the changing weather. SMOOCHIES!! I'm just as surprised as Shawna is about your snow. Today it was 88 here in Florida. Tonight it will be down to 68. We are going to have mid 80's all week with upper 60's at night. No windows open here yet, we are still running a/c. We don't normally get to open windows very often because we usually go from hotter than heck one day, to colder than that dog hatin' ex-football players heart the next day. Lovely 2 pager; thanks so much for sharing! Thanks so much for part B. Sorry I didn't leave comments on part A because I didn't know where to. I love love love your templates. Thank you. You are the only site that I go out of my way to check every day. I'm loving the snow too. I've been away from here for many years but I'm here visiting so this is my kids' first snowfall. I can't believe you are having snow! I just suffered through soccer and football games in 93 degrees worth of heat yuck! On the upside, the new templates make me happy! thank you for sharing this really nice template! thanks for the second side to the template. I love your things and the fact that you consider the rectangle scrappers as well as the square. I check here every day to see what you have created for us. We are just getting a taste of Fall - not ready for snow yet! I don't know how you keep creating so many great templates, but I'm glad you do -- I love them and use them all the time. Thank you very much! Thanks for considering making the shapes! So pretty!! Thanks a lot for part B and the 3 choices!! Snow already?? I'm not at all ready for that! Thank you so much for side B! Thanks so much; love it! I'd much rather see snow than the 90 degree humid weather we are having in Houston....I'm really tired of it and want some cool air! I tried severeal times yesterday and this morning, but was unable to download Part A. Snow, what's that???? It's still 90 and 91 here in FL. We won't turn out a.c. off until sometime in Nov.!! Thanks so much for sharing side B of this great template, as always I love it!! Thank you for the wonderful template! I am soooo glad it is you with the snow and not me! Only because I heat with wood only, long story, and it is not an easy thing! although I have already made my own (though not done them yet) I Can't wait to see your calendar templates! What a sweetie you are! Thank you for the template! I love your work. This is a great template. Thank you so much for sharing. Thanks so much for the lovely fall template. I'm sorry I missed part A. Snow! Yikes! We're still playing baseball here in Ohio. My 10 year old son had 3 games this weekend and we're still in the 80's. Thanks for side B. It's a wonderful template! Hi! thank you for side B! your templates are great! cant wait for the calendars! thank you for all the sizes! I was hoping you would leave the link for part A till the link worked. I tried all day yesterday to get it and got an error everytime. Any chance of you putting it up again. Please please put A side up again- kept getting the set to private message everytime I tried for 2 days. Thanks so much for the templates - I always look forward to checking your blog and seeing what you have put together. Thanks for sharing! Thanks a lot for sharing this gorgeous template! Another beautiful template!!! I wasn't able to get side B either, said 'set to private' hopefully if i keep checking in the link will work. Thanks so much for sharing your wonderful talent with us.